Glenda's Creative Place -Paper Crafting fun, CRICUT, CLOSE to MY HEART Consultant, Stamps, ... : Want a discount for tickets for CHA Craft SuperShow (for Consumers) in Anaheim, CA- Jan 22 & 23, 2010? 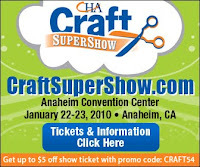 Want a discount for tickets for CHA Craft SuperShow (for Consumers) in Anaheim, CA- Jan 22 & 23, 2010? In addition to the regular Retail Winter CHA (Craft & Hobby Association) show this year, CHA is also hosting a Craft SuperShow, which is for Consumers/Crafters. It's also at the Anaheim Convention Center (directly across from Disneyland!!). The dates for the Consumer Craft SuperShow are Friday, January 22 & Saturday, January 23, 2010. It is open to anyone who purchases tickets!! If you want to go to the (Consumer) Craft SuperShow & would like to get a discount on the purchase price of your tickets, feel free to use this code (from my site) : CRAFT54. I hear there's a lot of folks from the Cricut Message Board that are going to the Craft SuperShow & then meeting up on Saturday evening over at Bubba Gumps (across the street in Downtown Disney). If you want to meet up with all of us crazy Cricut people, go onto the Cricut MB & send a PM to ScrappinKittyRN, who is organizing this dinner event!! Hope to see you there!!!! ***FYI---Please be aware, there has been some confusion about the two separate & distinct upcoming CHA Shows. 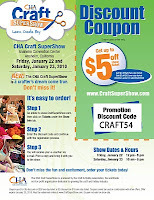 Purchasing tickets to the CHA Craft SuperShow admits you to the Consumer CHA show only!!! It will NOT admit you to to regular Retailer/Manufacturer Convention, which begins AFTER the Consumer show is over!! In order to be admitted to the Retail CHA Conference, you MUST have a valid Badge, only available to those who are registered members in good standing of CHA (retailers, manufacturers & designers) & their employees.